laybets review | Think twice..
*Update 16/8/13 at end of post.. They offered to give me a free two week trial of te service where they send out sms alerts of the laybet selections being bet in the races. Seemed to start out ok. The selections come on Wednesdays and Saturdays. All the ones on Wednesday were successful lays. The SMS alerts were pretty co-incidental to the race times and if I checked quickly online the result still wasnt displayed on any bookamker site as the result was still provisional. So the selections seemed good..but what was really going on..? 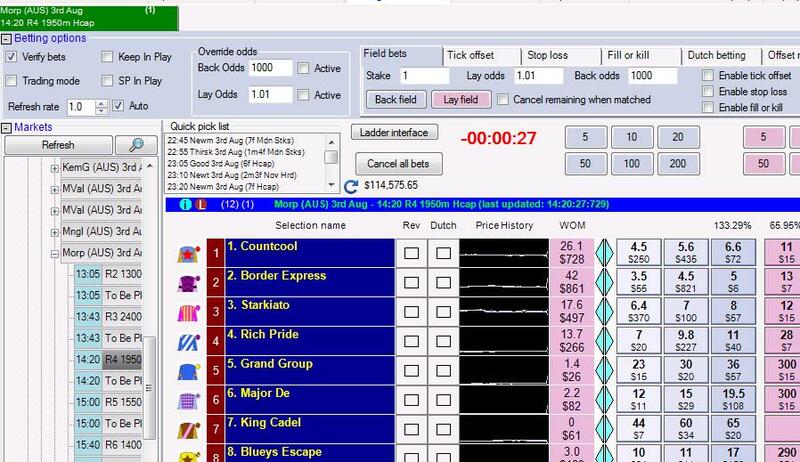 I wanted to check just how close to the start or finish of the race the alerts were coming, so I started to check using a program that I have for placing bets via Betfair. It is called Gruss software. 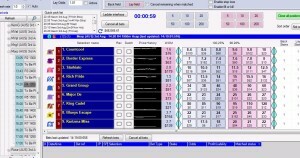 It gives virtually, to the second, live prices on the Betfair exchange. Theres a countdown to race start time and then the Race code turns green when the start gates open and the race starts. On Saturday I started to monitor the races live. Not every race has a selection, and my theory was that they wiat until a favourite loses a race and hen shoot out the sms just as the race finishes, but before the results are up. Sure enough, I followed a race where the favourite lost ( I can see that instantly on the Gruss software because the live betting odds start to blow out as the horsestarts to have no chance of winning. The sms came through seconds after the race finished. This happened not just once, but several times, whenever a favourite, or sometimes a shortly priced second favourite lost. Too often to be just late sms delivery, given that it was always seconds after the race finish and considering that the races are all different lengths of time . There was one race however where the sms came through a couple of minutes before the race. The horse in question here was a favourite at about $2.00. It duly lost, but I am thinking that they would occasionally put in an early selection at a short price. 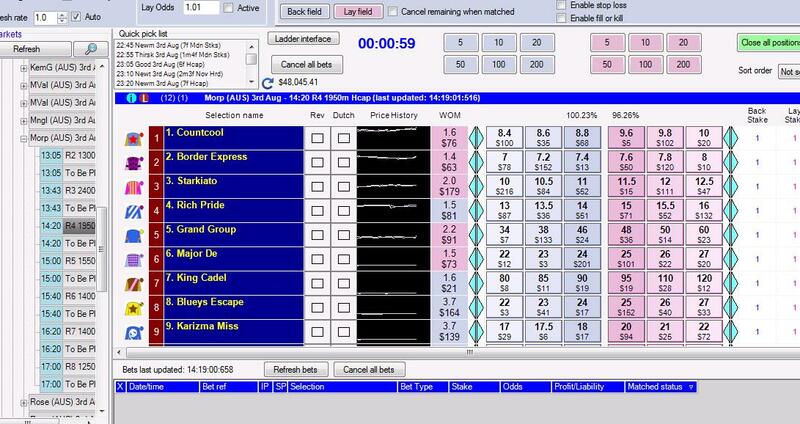 If it lost, all good and it looks like another success, plus they can boast that it was posted before race time. If it is unsuccessful, then it is only a minor loss, amd of course, you cant win all the time is what they will say, and what any reasonable punter would expect too. I havent received the sales phone call yet, and will update when I have.. Steer clear of this one. You have been warned (advised) !! 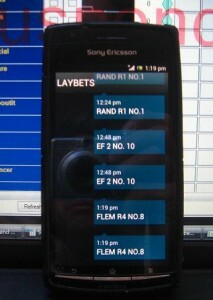 I again received text alerts for the lay selections on saturday and was able to be at the computer to monitor the times they were sent. As usual, most of the came through just after the races ended, along with another successful selection of course. There were three that came through before the race started..two were successful and one was a loss. I managed to take screenshots right as the race ended, as shown by the word, suspended, being flashed on the screen. Also took photos showing the time the texts came through for these races. See examples below. It is a variation of the scam called past-posting. Here is a clip from that seventies classic The Sting where they reveal the scam. The whole film is well worth a watch! I questioned them about the texts arriving after the races finished and they said that is because they are sending out about 700 texts at a time. They could not explain how the texts uncannily arrived 10 to 15 seconds after the race finish….given the supposed random nature of their sms server. The guy is getting back to me after he speaks to their IT person, regarding time stamps of their sms sendings. We will see. Not holding my breath. Also he mentioned that they know which horses to lay because they watch the money coming through on their bookmaking platform and they KNOW which money is the punters, the professionals, the Jockeys..blah, blah, blah. I asked him how they knew which was the jockeys money. He said they just know. I kept asking. He kept saying they just know. Also, Topazair Pty Ltd that they have listed in their contact details was listed by ASIC as being proposed for deregistration in October 2013. Why? 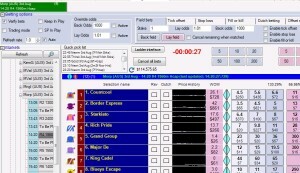 This entry was posted in Uncategorized and tagged lay bet scam, lay betting scam, laybet scam, laybets, laybets review, laybets scam, laybets.com.au, laybets.com.au scam, www.laybets.com.au, www.laybets.com.au scam on August 3, 2013 by admin.